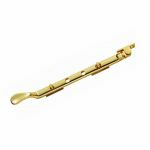 A Victorian casement stay finished in a high quality polished brass. It provides added security whilst the window is closed and holds the window in place whilst open. Is reversible meaning it suits both right and left hand opening windows, it is also suitable for wooden windows.